After a week-long break the China’s stock market has come online and it has begun the new week with some gains. Shortly after 6:00 am GMT the Shanghai Composite is gaining roughly 1% while the Hang Seng (CHNComp) is rising 0.15%. It needs to be said that Chinese Vice Premier Liu He confirmed over the weekend that he would join trade talks scheduled to take place in Beijing on February 14-15. The event will also host US Treasury Secretary Steven Mnuchin and US Trade Representative Robert Lighthizer. Nevertheless after the news that Donald Trump will not meet with Xi Jinping before a March 1 deadline hopes for a trade agreement have lowered a bit. Apart from this topic, the People’s Bank of China slashed its daily reference rate for the yuan by 0.62%, the largest revision since July 2018. Finally, investors in the world’s second largest economy have driven up local iron ore prices substantially in response to sharp rises seen in the prior week when Chinese markets were closed. 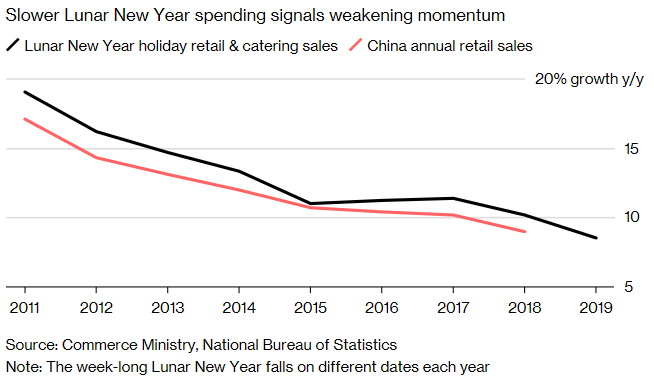 As far as the China’s Lunar New Year is concerned we got information from the China’s Ministry of Commerce that people spent $149 billion at restaurants, shopping malls and online outlets - a 8.5% YoY increase, but the slowest pace of growth since at least 2011. It is worth noting that Chinese people were attracted by online shops as sales in the internet jumped as much as 43% YoY, according to data provided by JD.com, the second largest e-commerce site in the nation. Note that sales numbers during this holiday were coincided with the pace of growth of retails sales over the entire year, as evidenced by the chart above. Therefore, one may expect that consumers spending in China will continue decelerating through the year. In 2018 China’s annual retail sales grew 9%. There is no doubt that liquidity conditions during Asian hours trading are really poor and from time to time some chaotic moves occur. It was the case last night when the Swiss franc tumbled almost 1% at the start of Asian trading on Monday. Note that thin liquidity was additionally caused by a Japan holiday. As a consequence, the USDCHF spiked more than 100 pips just in a few minutes and it erased the entire move several minutes later.